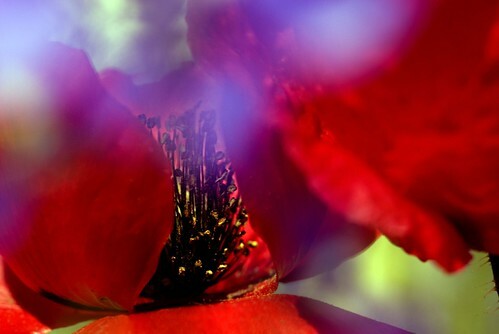 Poppy Revealed, photo by Harold Davis. View this photograph larger. The luminous effect in these photos is reasonably easy to achieve—and has nothing to do with Photoshop. It is a pure photographic effect, achieved using good old-fashioned photographic tools and an understanding of the key elements of exposure. It’s one way to enjoy macro flower photography on a windy day. You need flowers with contrasting colors in motion. 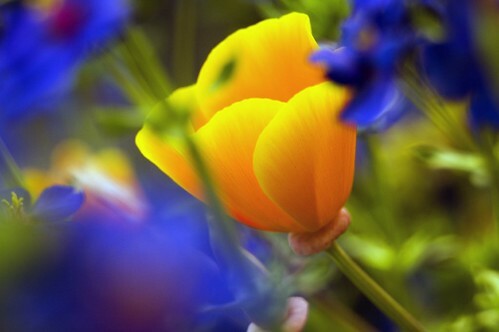 The idea is to focus on one of the contrasting flowers. Ideally, the in-focus flower will be relatively still. The other flower will be out of focus, and is often postioned in front of the “sharper” flower. The out-of-focus flower should be blowing in the wind. Use a tripod. 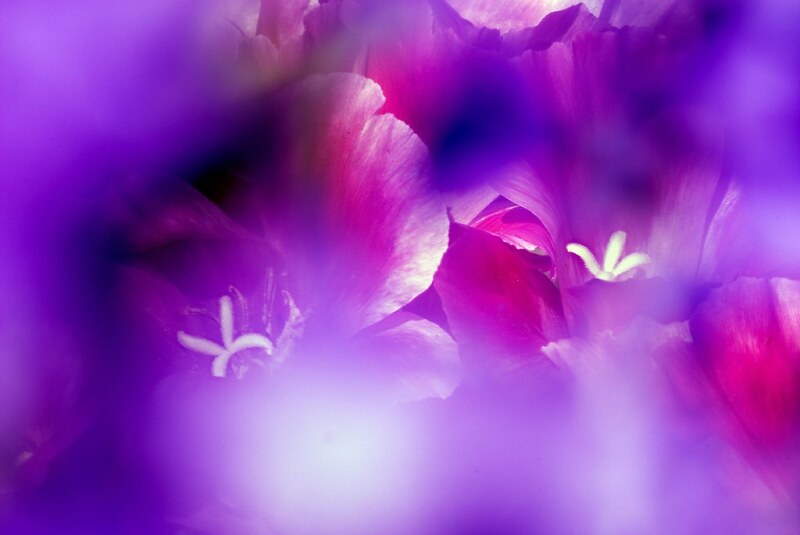 Set the shutter speed/aperture pairing so that the relatively stiller flower that is in-focus will be rendered fairly literally, while the foreground out-of-focus flowers that are waving madly in the breeze become a luminous blur. 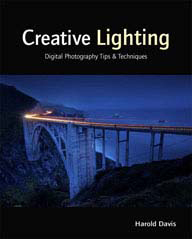 As you might expect, this technique takes a great deal of trial and error, and usually a whole bunch of lousy photos for each good one. View this photograph larger. Read the original blog entry about this photo. Death in Bodie, photo by Harold Davis. View this photograph larger. 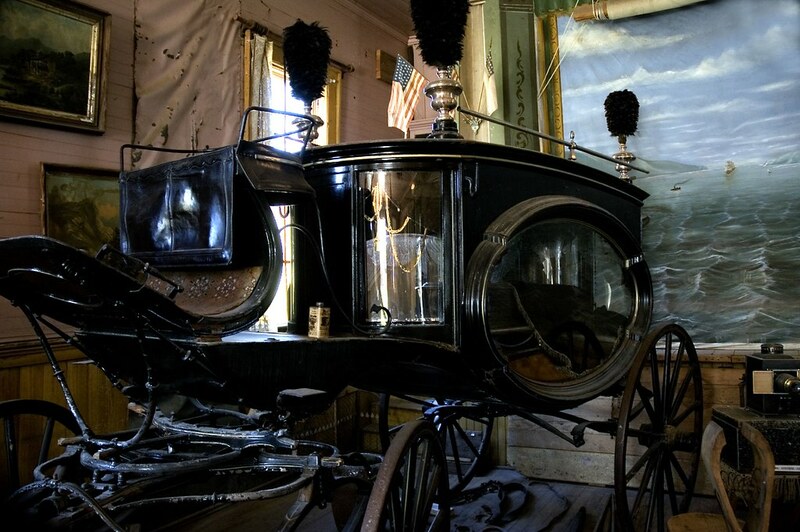 They’re dying to get into Bodie, a ghost town east of the Sierras in the high desert. Here are some more photos of Bodie from my trip with Julian last summer. 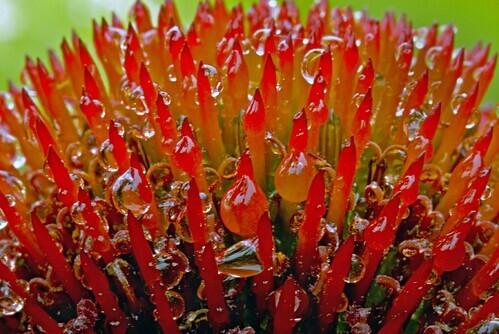 Echinacea Water Drop, photo by Harold Davis. View this photograph larger. This water drop, on a hybrid coneflower (	Echinacea Big Sky “Sunset”) has obviously been highly magnified. I used a combination of a macro lens, extension tubes, and a close-up filter, with the most depth-of-field I could get. The trick here is to focus accurately, and to be patient enough to wait for the subject to be still. 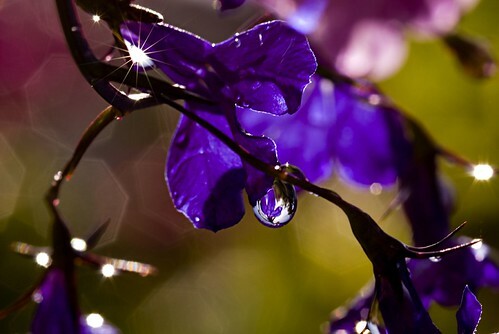 If you’ve ever carefully observed water held in place by surface tension—like this water drop—you’ll realize that is seldom totally motionless, even when there is no wind. I like most about the photo the way you can see a second reflection of the coneflower petal if you look down in the reflection to the right. Echoes of endless depths, endless reflections, and world without end. Day Lily 2, photo by Harold Davis. View this photograph larger. OK, so I’ve “borrowed” Michael Pollan’s excellent title for this story. These photos are of day lilies. The subject is mostly the stamens, or male sexual organs, of each flower. 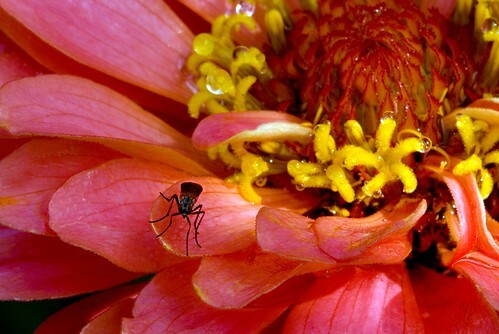 The stamen consists of the anthers at the top of a delicate stalk, and the stalk itself, called a “filament.” The anthers host the pollen, used for fertilization. 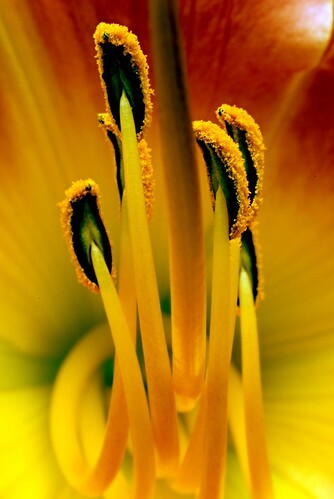 In the photo above, stamen cluster around the single pistil (really, the style belonging to the pistil). You are looking down into the ovary. In contrast, in the photograph below, a group of stamen are standing upright, anthers waving in the breeze. 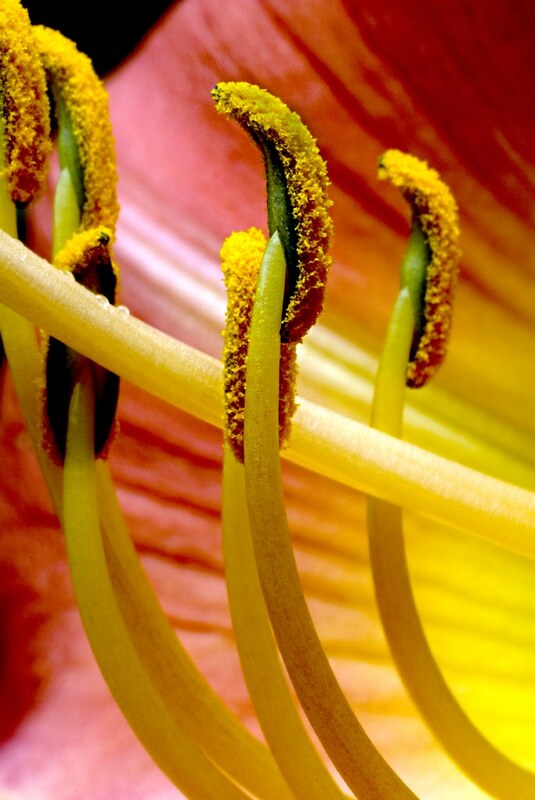 The stamens are grouped around a single style, which is perpendicular to the stamens. The style is part of a pistil with stigma to the left (out of the photo), and comes out of an ovary to the right (also not visible). These day lilies grow along the little side path right outside our kitchen door. I photographed them sitting on the stone flagstones we’ve used to pave the area. I have a new macro lens, a Sigma f/2.8 50mm. This is a fairly inexpensive macro lens, and it seems pretty sharp. When I add an extension tube to it, and get real close to the subject (like I did with these photos, poking my lens right into the flower), I can get really crisp magnifications. These photos were routinely processed with no special gimmicks in Photoshop. Of course, the photos are not about botany, the sexual parts of flowers, my kitchen path, or the lens I used. They are about color, lines, and grace. My Garden Fence, photo by Harold Davis. View this photograph larger. The appearance of a reflection is made by the subject matter reflected—and by the direction of the light that is causing the reflection. In the morning, water drops in my garden mostly reflect flowers and the garden, and the rising sun. 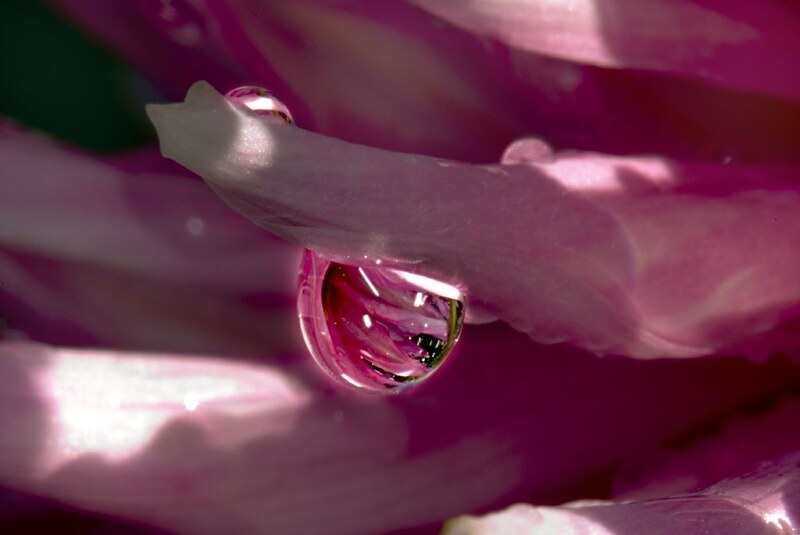 In contrast, in the late afternoon, when the angle of the sun has shifted to behind our house, water drops in the same location reflect our garden fence—as in this photo of water drops on a dahlia. Trapped, photo by Harold Davis. View this photograph larger. Up close, this opening dahlia blossom is certainly beautiful in a slightly translucent way. But the flower is also frightening. If I were sized to scale, for example a honey bee, I’m sure I’d worry that the trap was about to close, even as I was irresistibly drawn inwards. 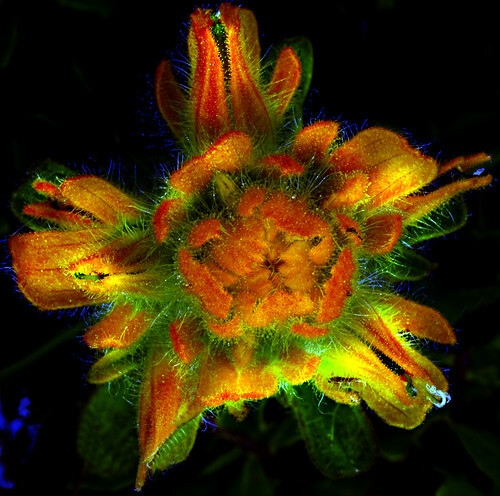 Indian Paintbrush, photo by Harold Davis. View this photograph larger. 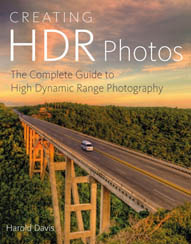 It’s fairly well known that digital sensors are more sensitive to infrared (IR) than either film or the human eye. In fact, this is so much the case that digital cameras are equipped with a filter that screens out IR. You can capture IR photographs either by removing this factory-supplied CCD filter, or by adding your own filter to the camera. Less appreciated is that digital sensors also can pick up more ultravioltet (UV) light waves than film or the human eye. As with IR, this effect can be amplified using filters. At the lower end of the UV spectrum, you’ll find xrays—so the ability to harness UV waves lets one “see” through, or inside things, a facility used in snooping and military devices that provide night vision. Altogether, photographing light waves one cannot see is a crap shoot—you don’t really know what you are going to get. But in some circumstances so is taking normal photos with a digital camera, this photo being a case in point. It has been minimally processed in Photoshop from the RAW version. Phyllis and I were hiking on the Chimney Rock Trail on Point Reyes (probably the most western trail in the continental United States). Rachel was taking care of the kids. We figured we hadn’t been hiking alone together in, well, eight or nine years—so a memorable occassion. It was early evening with a bright but low fog. This Indian Paintbrush was sitting by the edge of a headland cliff. The reds and greens of the flower glowed with an incredible intensity, and almost seemed to smolder, or vibrate. The image does not capture these colors. At the same time, the blue tendrils in the photo were not apparent to our human vision. 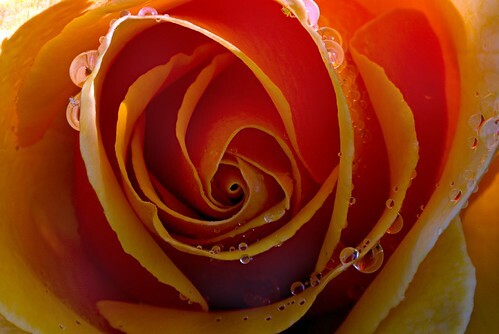 Orange Rose, photo by Harold Davis. View this photograph larger. It’s the details that make this photo for me (you may have to view it larger to see them). 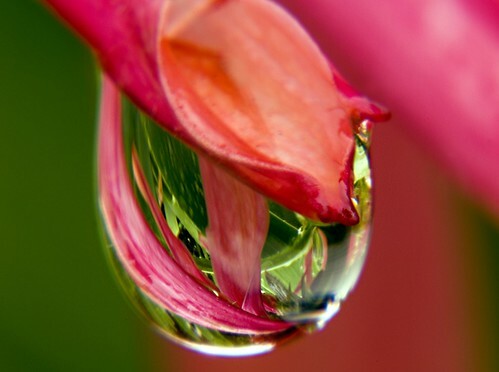 For example, the insect hanging upside down at the top, and the water drop with three bubbles inside it at the bottom. High Dive, photo by Harold Davis. View this photograph larger. Everyone slept relatively late this morning, and when I came downstairs with the kids the last of the soft morning light was disappearing. I asked Phyllis if she minded tending the kids for ten or fifteen minutes while I took some photos, and she accepted the role of photographic widow and maternal martyr gracefully. The windows were open, and inside I could hear the kids creating their usual chaos. I saw this bug on a zinnia, and I prayed the photographer’s prayer: please hold still while I capture this one exposure. My prayer granted, and the insect captured on my memory card, I headed back inside to face the new day and what it would bring—just like this bug. 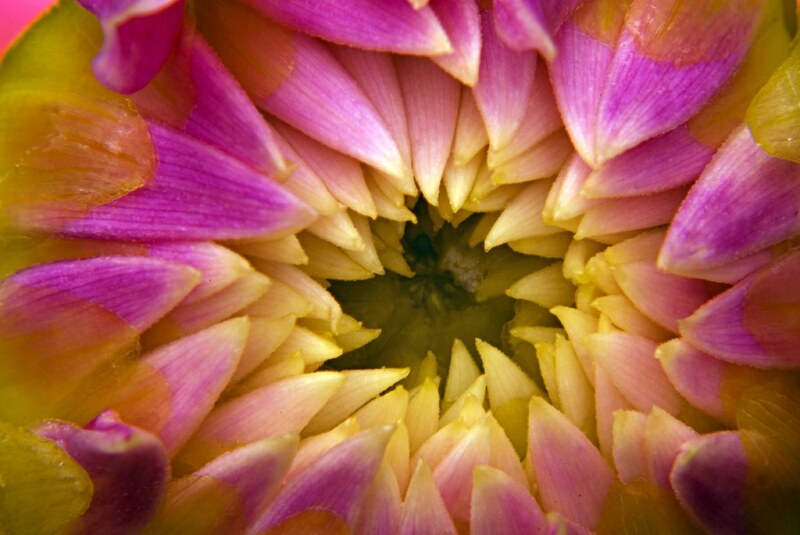 Beneath the Dahlia, photo by Harold Davis. View this photograph larger. We are trained to view flowers by looking down at them. Or, on occasion, at the level of the flower—for example, when smelling a rose climber. It’s amazing to me what a different view there is from beneath a flower. For example, this rear view of a dahlia in my garden shows the true transparency and elegance of the flower glistening with water and sunshine early in the morning. 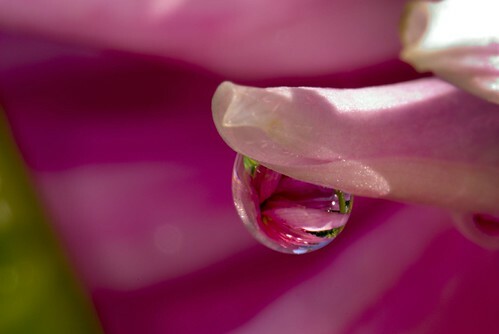 I took this photograph of a water drop on a lobelia with my 105mm macro lens handheld at 1/60 of a second and f/18 belly and face down in the wet grass, on my back, looking up at the early morning sunlight through the flower. I simply couldn’t get a tripod into the place the camera needed to be to take the photo. This is one of the rare times that a vibration reduction (Nikon calls this technology VR, and other camera manufacturers call it various other things) would make sense in a macro lens. 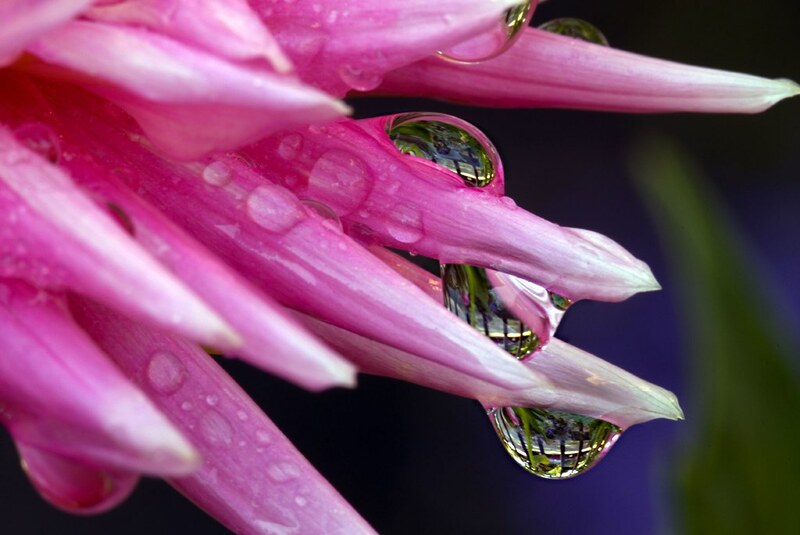 The reflection of the lobelia in the water drop reminds me of a blue trident, or maybe a cactus! Hard-Working Feet at Rest, photo by Harold Davis. View this photograph larger. Nicky goes full stop until he stops. I couldn’t resist this chance to photograph the boy-usually-in-motion at rest using a tripod, long exposure, and high depth-of-field. These feet work hard! Vernal Falls In Autumn, photo by Harold Davis. View this photograph larger. 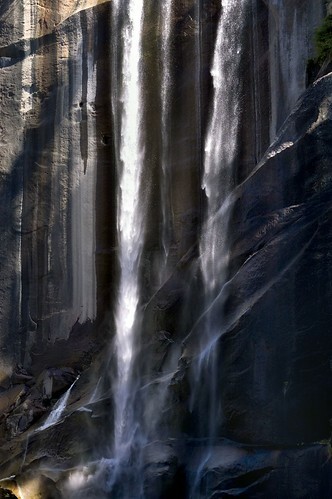 This is a photograph of Vernal Falls, known as Yan-o-pah by the Miwok, taken in October 2005 on my trip to Yosemite, the eastern Sierra, and the California desert. By early October this water fall is usually almost one of the only water falls still flowing in Yosemite Valley. I like the contrast with the roaring waters of the falls in the spring, and (in this photograph) the way the water plunging over the edge of the falls seems to form just another striation in the rock. Exposed twice from the RAW file in Photoshop, with the highlights of the water painted-in using a layer mask to bring out more detail in highlight areas. 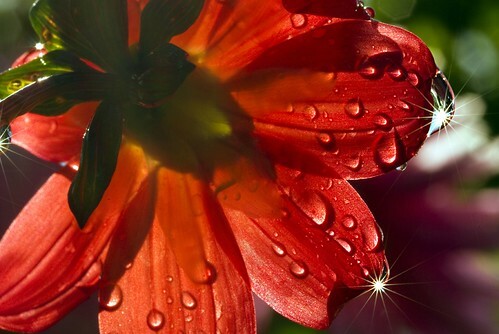 Dahlia Drop 2, photo by Harold Davis. View this photograph larger. It occurred to me to try to solve one of the practical problems I mentioned with extreme macro photography in my garden—waiting for the wind to completely stop so the subject is very still—using the slow flash technique that I wrote about here. Except that, with these studies of a water drop on my dahlia, I mounted the Nikon SB-R200 flash units on a ring at the end of my lens rather than tripod mouinting them for backlighting. The point here was to stop motion, not provide a translucent effect. These photos were exposed at roughly .4 of a second and f/36—plus the flash, of course. This works pretty well to stop motion on the surface of the water drops, I think. 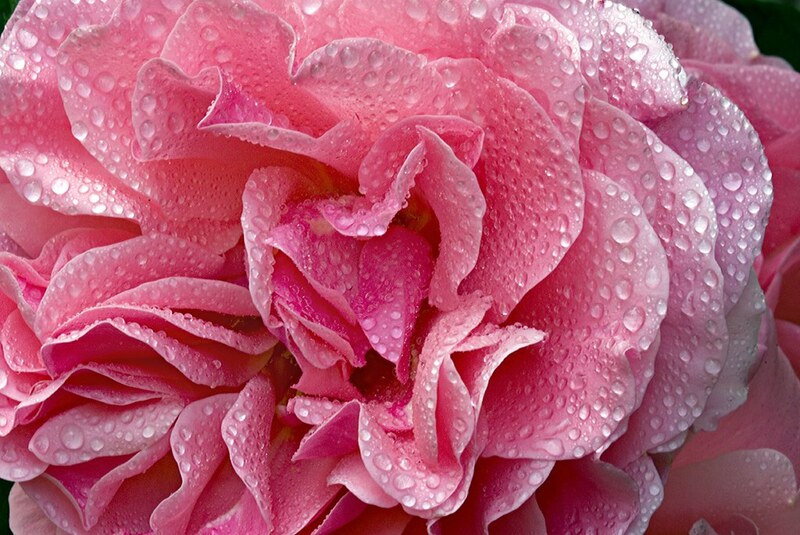 Rose Heart, photo by Harold Davis. View this photograph larger. 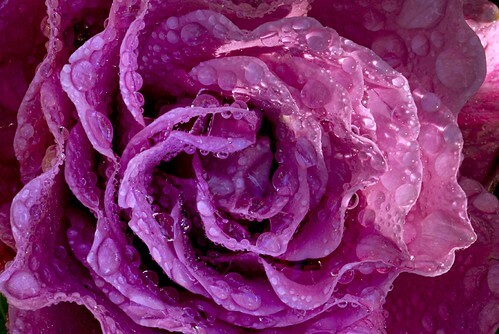 Here are two roses with water drops from my garden for your viewing pleasure. The rose on top is a Dreamweaver from Jackson & Perkins. The one below is an Angel Face—always especially romantic to me because it was the flower that Phyllis and I featured at our wedding.